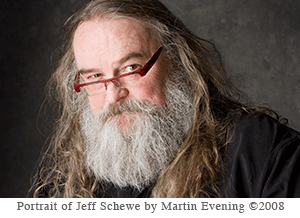 Jeff Schewe has been an award winning Advertising Photographer in Chicago for over 25 years. He is accomplished in tabletop, location, portraiture and particularly accomplished in computer imaging. Jeff shoots a variety of subject matter and likes to control as much of the production as possible. He does this by making his own models, designing and building his own sets, painting backgrounds and employing computer imaging. He has been doing his own imaging for over 15 years in house on his high-end Macintosh systems. He is the coauthor of Real World Camera Raw with Adobe Photoshop CS5 and Real World Image Sharpening with Adobe Photoshop, Camera Raw, and Lightroom (along with the late Bruce Fraser) and is also coauthoring a book with Martin Evening titled Photoshop For Photographers: The Ultimate Workshop. Jeff has a variety of video tutorials available with Michael Reichmann of the Luminious Landscape on digital printing, Camera Raw and Adobe Photoshop Lightroom. Along with his his former and current partners; Martin Evening, Mac Holbert, Seth Resnick, Andrew Rodney, the late Bruce Fraser and the late Mike Skurski, he is a principal and founder of Pixel Genius LLC, a software developer for Photoshop related image processing such as PhotoKit, PhotoKit Sharpener and PhotoKit Color.